UNIVERSAL SYSTEM SCAFFOLD will conform to all applicable government regulations when erected properly and used safely. This material provides information on general erection guidelines. Consult your scaffold supplier or manufacturer if additional information is required. 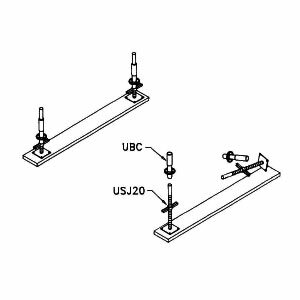 Position the screw jacks (USJ20) centered on sills and assemble the base collars (UBC) as shown. The amount of exposed thread on each jack should be equalized. For uneven elevations, start at the highest point and adjust the screw leg to its lowest position. Select the required length of load bearing horizontal (A) and attach to the base "Rosette" using the quick 900 slot. The horizontal slot in the mouthpiece should go over the quick 900 slot with the wide part of the wedge on top. Hand tighten the wedge/rosette connection. The nonload bearing horizontals (B) are attached in the same manner. Members "A" and "B" should now be leveled and squared to each other and connections secured by striking the wedge downward using a hard mallet or 1 lb. claw hammer. Insert appropriate height of "Standard" into base collars. Align quick 900 slot of rosette with holes in base collar. 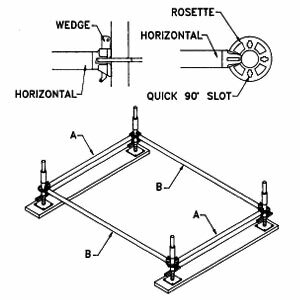 Assemble a second set of load bearing "A" and nonload bearing "B" horizontals on the rosettes at a maximum of 6'-6 3/4" (every four (4) rosettes). Secure these items in the same manner described in Step 2 (Page 4). Universal System Scaffold must be braced diagonally in the vertical plane as illustrated. 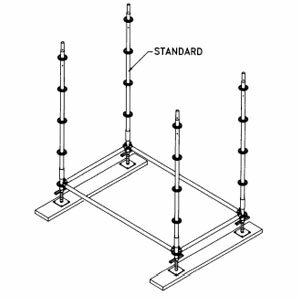 To erect a wall-type scaffold, continue assembling standards in sets of two with all associated components described in previous steps. 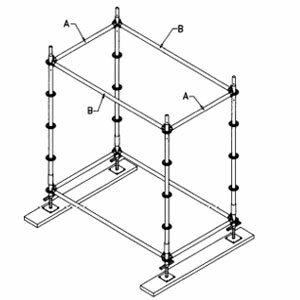 When the scaffold height exceeds four (4) times the minimum base dimension, it shall be secured with rigid ties to the structure at that elevation. Wall tie intervals should not exceed 30 feet horizontally and 26 feet vertically. Also, install ties at the tops of scaffolds which extend more than one lift above the previous ties and at the ends of scaffolds which extend more than one bay beyond the previous ties. These ties shall be attached as close as possible to the rosette where the bearer and runner meet. 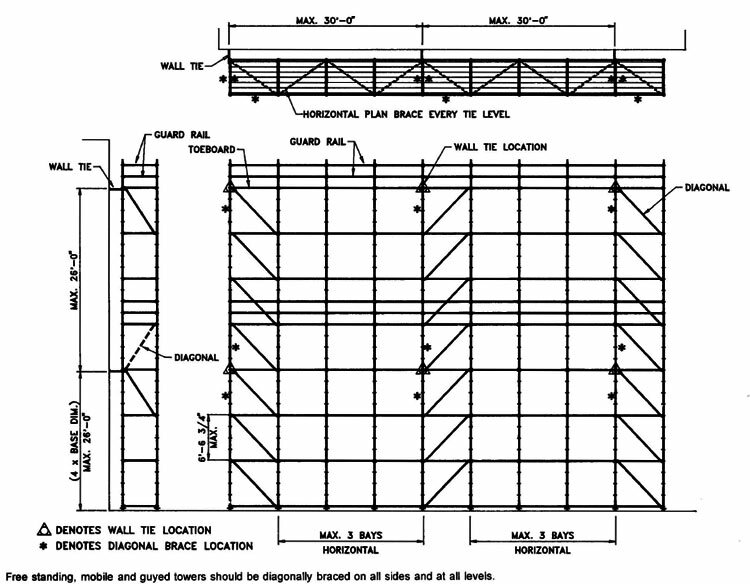 Horizontal plan braces shall be used to square scaffold at the base and at tie-in levels. Guard rails and toeboard are required on all open sides and ends of fully planked working levels. When stacking standards, all joints should be secured by nut and bolt. Safe access and egress should be provided with rest platforms at levels not to exceed 35 feet vertically.